Factor’s, an L.A. institution, has become a go-to in the Jewish community for life’s biggest celebrations and also everything else. 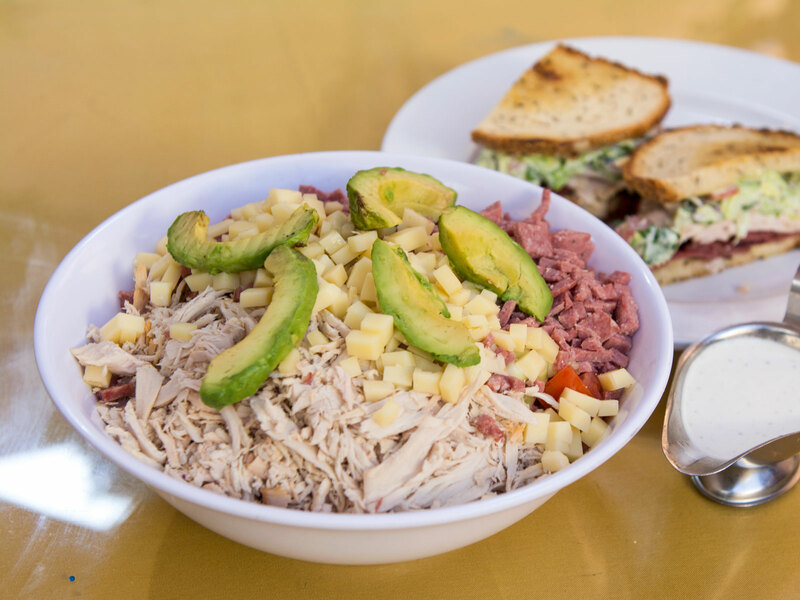 Factor’s Famous Deli, an iconic Los Angeles restaurant that’s celebrating its 70th anniversary this month, is an institution that always has an eye on adaptation. Factor’s, which was opened by Abe and Esther Factor, has been at the same Pico Boulevard location since 1948. Debbie’s father, Herman Markowitz, purchased the deli in 1969. About 80 percent of its customers are regulars, including families that have brought a fourth generation into the restaurant. The core of the business, obviously, is classic Jewish deli food. But Debbie, who runs Factor’s with her older sister and her older brother, Suzee and Marvin Markowitz, knows there’s a lot of value that comes with revising the classics. Factor’s changed the way it prepares and serves its pastrami about a year-and-a-half ago, for example. “Since we’ve changed the way we roast it, we’re probably selling four times as much,” Debbie says. In the past, Factor’s cooked its pastrami for less time and machine-sliced it. Factor’s, which had an over-the-top, sold-out anniversary celebration on Tuesday night with guest chefs Nancy Silverton, Adam Perry Lang, Hedy Goldsmith, Jonathan Waxman, Josiah Citrin, Bruce Kalman, and Micah Wexler, is a restaurant with something for everyone. Debbie laughs when I look at the menu and point out that there are actually close to 30 salads. She’s known at the restaurant for doing things like making new dressings by mixing together existing dressings, so the experimentation never stops. “I’m not a trained chef, but I like to play with different concoctions,” Debbie says. The restaurant’s most popular salad, Debbie’s Chopped #1, has been turned into a special sandwich for this month’s anniversary celebration. Instead of having lettuce, turkey, salami, Swiss cheese, red onion, avocado, tomato, and cucumber in a salad, the ingredients are served on grilled rye bread. The cheese is melted, the salami is grilled, and the turkey is warmed in broth to keep it juicy. The vegetables are mixed in ranch dressing and stacked on top like coleslaw. It’s delicious. 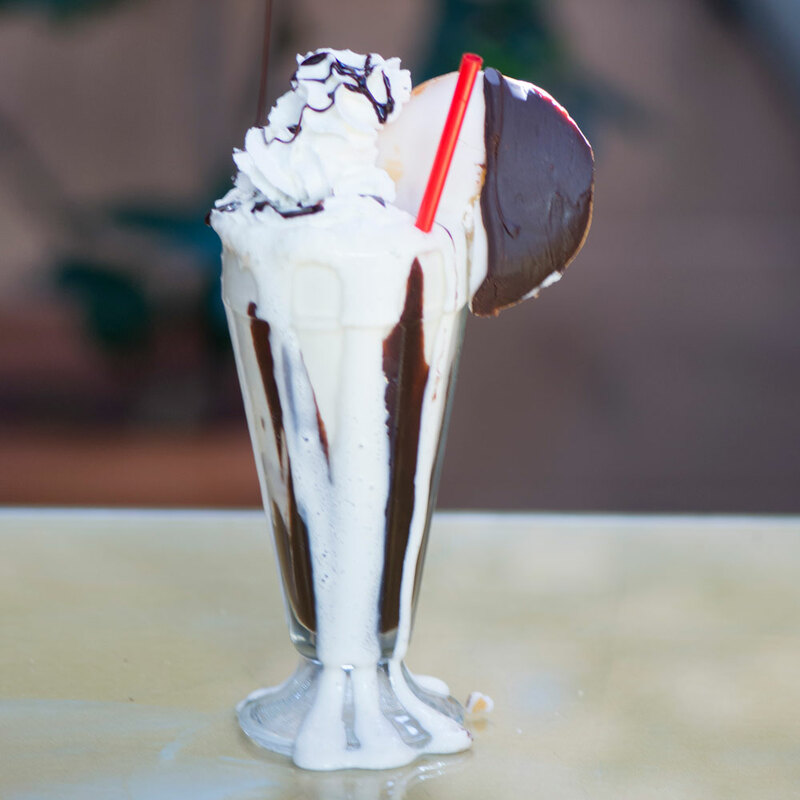 Another anniversary special is a black-and-white cookie shake, made with Fosselman’s vanilla ice cream, chocolate sauce, whipped cream, and crumbled cookie pieces. (Fosselman’s is a new supplier for Factor’s.) The restaurant also plans to serve Fosselman’s cappuccino double chip, a habit-forming, crunchy concoction that’s been a sensation at Dan Tana’s in West Hollywood. Factor’s, where Debbie is in charge of a massive, full-service catering business, is a restaurant that touches so many facets of its customers’ lives. Factor’s has become a go-to in the L.A. Jewish community for shiva and funerals. Suzee remembers a recent conversation when somebody told her that it was nice knowing that one phone call to Debbie would take care of all their catering needs during a sad and chaotic time. Funerals are reminders that nobody lives forever, but Factor’s feels like a place that will endure for generations. Just check out the children’s section of the menu, with about 40 items named after young relatives and customers. (Some of the items are the result of parents donating to a local temple in exchange for a menu placement.) So many of Factor’s guests are just getting started in life. So Factor’s is adding about 2,500 square feet to its existing 5,000 square feet and creating a new gourmet market with a hot case for dishes like short ribs and chicken. There will be fresh sandwiches and sides. There will be “unusual items” like hard-to-find crackers, cookies, and sauces. Debbie hopes to open the market in the fall. She and her family also run The Mark, a big event space down the street that’s hosted many parties, including Tuesday night’s anniversary celebration, where Kalman was a big hit with his cacio e pepe bar. “It did mean a lot to him that we carried it on,” Debbie says. It will likely be carried on for at least another generation. Marvin’s daughter Lauren is the restaurant’s full-time bookkeeper. Debbie’s 19-year-old daughter Maggie has worked at Factor’s and will be going to culinary and restaurant management school in New York. Debbie’s 16-year-old son Jake recently started as a host at Factor’s. The way the family sees it is simple: As long as there’s one person in the family who wants to keep the restaurant, Factor’s will be a Markowitz-run business. Meanwhile, 92-year-old Lili Markowitz still comes in to eat at the restaurant that’s been in her family for nearly five decades. It’s just part of the daily fabric of Factor’s, where Debbie and her siblings have been helping out since they were children, where Suzee will kiss and hug customers all day long. Debbie was just 6 when her father took over the restaurant; she remembers pouring water there when she wasn’t in elementary school, and she officially started working at Factor’s when she was 13. Suzee, who is four-and-half years older than Debbie, remembers being 14 and riding her bike from her West Hollywood home to Factor’s on Saturdays, so she could be the opening cashier at 6 a.m. The sisters have done (and continue to do) everything at their family restaurant. One day last week, Debbie waitressed for about 45 minutes when things got busy. But the story of Factor's starts much further back, when Herman and Lili first met. During the Holocaust, Lili was asleep inside a school in Romania that had been liberated when Herman first set eyes on her. Herman was part of the Czechoslovakian resistance army and was looking for his siblings when he saw Lili. He found his siblings. He waited for Lili to wake up. Lili, who had lost her family, opened her eyes and suddenly found her new life. Herman and Lili got married shortly after they met. Herman had a restaurant in Prague before he and Lili moved to America, first to Cleveland and then to Los Angeles. When Lili goes to Factor’s every day, she sees Herman’s legacy in every piece of hand-cut pastrami but also in every smile she gets from longtime guests and their children and grandchildren and great-grandchildren. So for its anniversary celebration, Factor’s is spending the next two weeks honoring customers, Debbie says. Guests will get free raffle tickets for dining at Factor’s, and there will be daily drawings for prizes like T-shirts and $70 gift cards. The grand prize at the end of the celebration will be 70 pastrami sandwiches, which the winner can redeem all at once or over any time period they choose. It sounds ideal for a family party or many family parties. It’s exactly what you’d expect from Factor’s.